If you’ve ever ridden on a city bus, you know what an…um, “interesting” assortment of people you’ll find there. And that’s just on a regular city bus – imagine how many more extreme personalities could fit on the Superliner Youngman JNP6250G, the world’s largest public transport bus. At 82 feet long (39 feet longer than standard buses), the monstrosity can fit 300 passengers. With two accordion ribbed sections, the bus can turn on the same radius as a regular, non-gigantic bus. 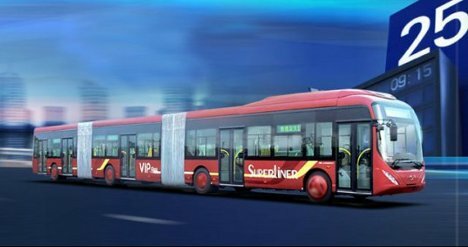 It was designed to make up the entire Bus Rapid Transit service in both Beijing and Hangzhou, cities with large and ever-growing populations that demand sensible public transportation solutions. And since the mega-buses will have their very own highway lanes, urban travelers will have another reason to leave their cars at home and let mass transit take them wherever they need to go. See more in Mass Transit or under Transportation. January, 2012.